This card is a wonderful example of Clean and Simple stamping, aka CAS. 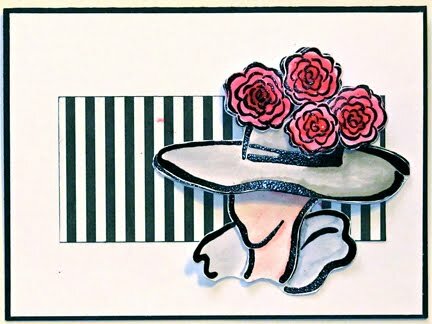 Linda used a simple layout, lots of white space, and just a splash of color in this fabulous card featuring the Rose Hat stamp from FranticStamper. The card is perfect for nearly any occasion with its simple elegance, don't you agree? I love the idea of attaching a stamped image to my card as a dimensional object but I really hate the fine, intricate cutting that often goes hand in hand with this. Some of the new die/stamp combo’s are really making this so much easier and so I wanted to have a go at creating a card using one of these amazing sets. Teal cardstock cut to a 5 ½ inch square card size. I began by cutting two pieces of the white cardstock into sections large enough to stamp the large flower bouquet on one and the two larger butterflies together on the other. 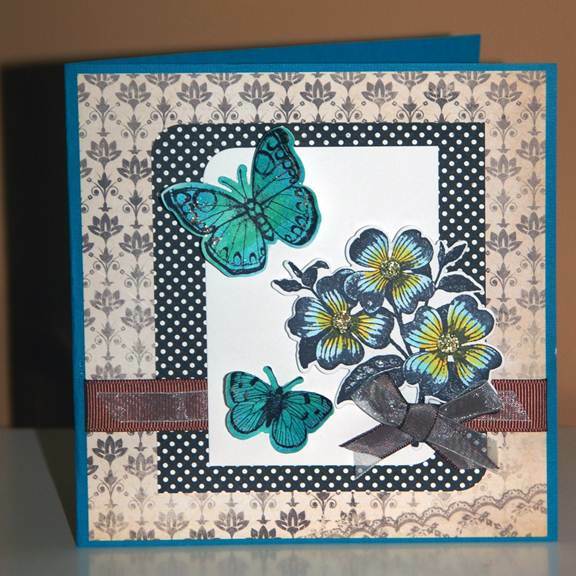 I then used the ink stains to colour in this second piece of card and once dried, stamped the two butterflies over this. I found cutting both of these butterflies out a breeze with this set. I simply had to layer the appropriate die over the top of each stamped image, centering the image within the die before running it through my diecut machine. I repeated this same process of cutting with the flower and it corresponding die then used the copics to color the flowers in. As a final touch, I dabbed the Diamond Stickles over the wings of the butterflies and dabbed the Antique Linen stickles onto the flower centres. To finish my card I layered the Timeless patterned paper over the base of my card then a piece of the Polka Dot paper and a piece of white onto the centre front before adding my ribbon layers and my stamped images. 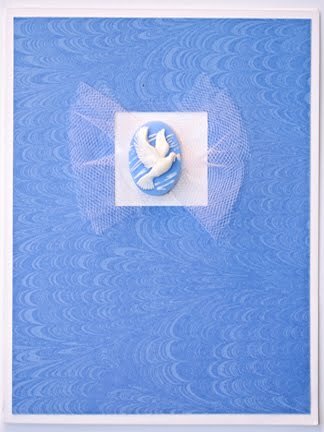 This simple but pretty card was made with the FranticStamper Marble Background Stamp, a FranticStamper Dove Cameo, and a FranticStamper Precision 1.25" base Single Square Die. The card can be made in mere minutes but who would ever guess? Warehouse Wednesday: Year-End Clearance Sale! Sale prices good for in-stock items. Once items on the year-end clearance pages sell out, we will not be reordering them. Quan! tities are limited to stock on hand. Thank you for your continued patronage. Wishing you a happy and healthy new year for 2013! Hi everyone! Lis here with a coloring piece for you. I really love this little kitty stamp from Stampendous. I colored the kitty all over with Scattered Straw,leaving the paws, chest and mouth alone. 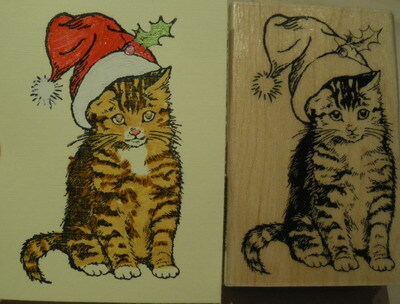 I then used the Spiced Marmalade to color the stripes of the kitty. I hope you enjoyed my little Christmas Kitty. I have a real thing for butterflies at the moment; I think it must be the freedom the freedom that they represent. 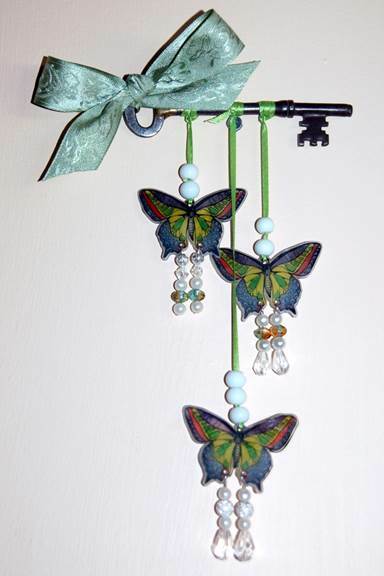 When I was at a nearby antiques store and found this old key, I decided it would be perfect to use to make a butterfly mobile. 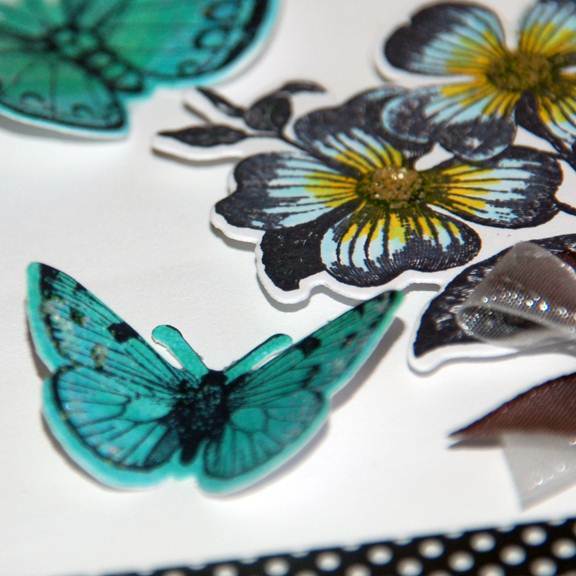 I began by stamping the Frantic Stamper Large Butterfly onto a sheet of Shrink film using Black Stazon ink. Once the ink completely dried, I turned it over and coloured the reverse side using Copic Markers then cut around each butterfly making sure to leave an edge. Shrink plastic is really easy to use, so long as you pre-cut everything you want before shrinking. 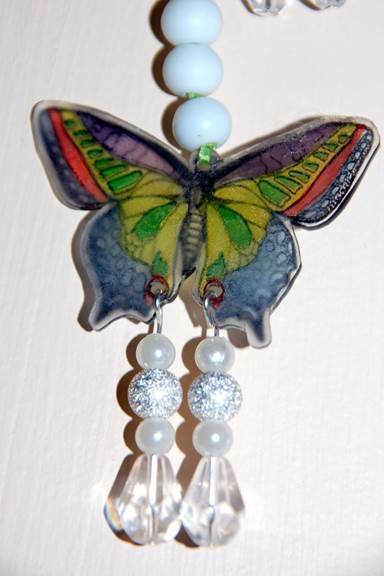 I decided to punch holes in my butterflies, one at the top and two at the base of each wing. After shrinking my butterflies and letting them cool, I tied a long piece of ribbon to the top of each and then to the key, staggering the lengths of the ribbon so that my butterflies each hung at different heights. Finally I added some beading to finish off my mobile and a ribbon bow to the key to finish my project. Today, I'm really really sad..... After more than 16 years in business, Frantic Stamper has fallen victim to internet fraud. Yep, no matter how careful you are, the thieves sneak by and when they do, it hurts big time. The story starts last month. We received a decent size order (around $600, which is not unseen for us) from a lady in San Diego, shipping to her "friend" in London England. This sort of thing happens all the time, so I thought nothing of it. I remember one of my employees making the comment of "I want to be her friend". About a week later, another order, this time from a lady in Apple Valley California, also shipping to England (this one for about $650) but shipping to a different recipient. Again, I thought nothing of it, other than "nice order". Another week goes by, and this time a $715 order from another person in California (San Diego), but delivering to the same person as the San Diego lady. Seemed strange, but not out of the ordinary. It wasn't until the 4th such order came through my desk that I started questioning. This 4th order was $737, and ordered from someone in Puyallup Washington, and shipping to one of the 2 above London England addresses. This time, I looked at it a little closer and something, I don't know what, but something told me there was something wrong about it. So I decided to do a little research. Looking back at earlier transaction, there was yet another big order ($470) a week before the above 4 orders..... so we're at 5 fishy orders now. Looking at this most recent one closer, I see the email address is a Hotmail address as were the other 4 (Hotmail or gmail on all). I then tried to call the phone number provided, only to get a recording from a defunct bank stating the phone number was invalid (still connected, but a recording stating it was invalid and the bank had closed). Now my heebee-jeebies are really going off. I tried to email "Barbara" asking her to call me because I had a question about her order. She emailed back stating she couldn't call me because she was in Puerto Rico. I'm pretty sure they have phones in Puerto Rico..... something's not right. 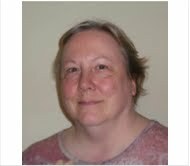 She tells me her "scrapfriend" needs the items urgently and to please send the order without the missing item. Hmmmmmm.... Something is not right..... so I stall her a bit. I emailed her the next day and told her we would ship the order "Monday". Meanwhile, I contacted my account rep at PayPal (who handles all our merchant services transactions .... i.e. credit card payments). I gave our account rep all the details of all 5 transactions and after 24 hours of investigating, his answer was 1 word: fraud. We were advised to "refund" the latest transaction (the $737 order), and to just "wait and see" for the other 4. Well, this morning, the bombshell that was expected came. The first transaction was indeed reversed by the "buyer's" credit card company as an unauthorized transaction. F.R.A.U.D. It's just a matter of time for 3 more big "payments" to be reversed. So what happens in these cases? -The thieves somehow get their hands on a victim's cc info and address. -They place orders online with unsuspecting businesses such as ours. -Credit cards are run automatically behind the scenes by Paypal using address verification. It's all encrypted so we don't see anything but an authorization number. -We fill the order and ship it. 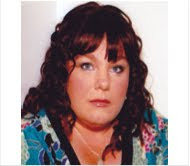 -A month goes by and the victim gets their credit card statement with fraudulent charges. -Victim contact their credit card company and says "I didn't buy anything from so-and-so"
-Paypal contacts us and TAKES the money back. In the end, the thieves have the merchandise, and we have zippo. We can show that we shipped the package, but that means nothing. Since the thieves are overseas, we can't very well travel to London to press charges, or throw a rock through their window. All we can do is cry. I've been enjoying working through the varied techniques that are available on YouTube. 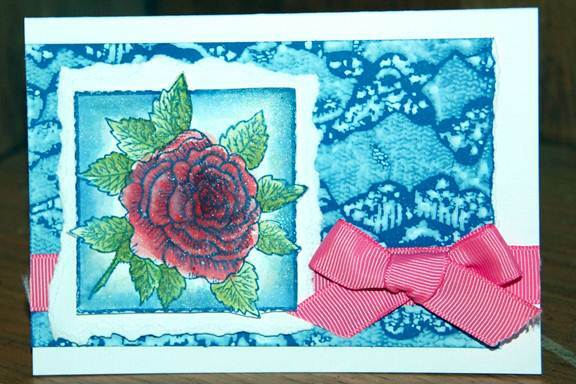 This card features one created by Tim Holtz where you ink a piece of card using Distress ink (I used Broken China) then cover a background stamp with the Picket Fence Distress Stain and stamp the card. When it dries, it leaves a faded image of the stamp. I used a Frantic Stamper Lace Background for mine. To finish my card, I tore an edge off and adhered it to a card base with a ribbon strip and a colored image. I chose to use the Frantic Stamper Rose square no. 4 stamp, which I shared yesterday. I love roses; everything about them is just so pretty. This particular image appealed to me because of the frame around it which makes cutting it out really simple. I stamped my Rose Square No.4 image using a Distress ink called Chipped Sapphire then used the ink and a waterbrush to shade the edges of the frame gently lighting up towards the centre, making the rose stand out. 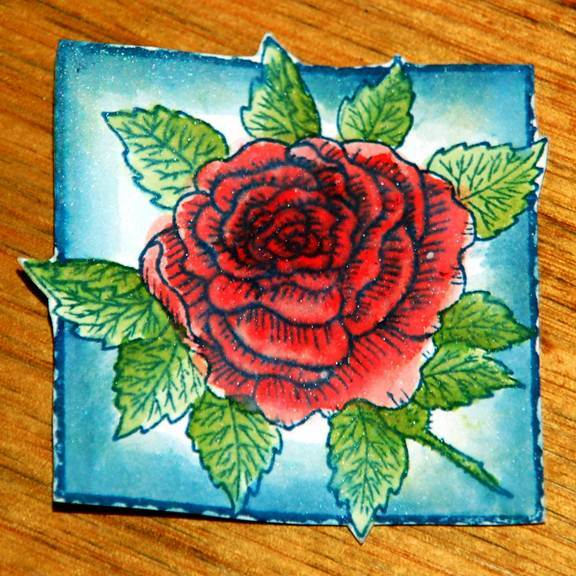 I then coloured my rose in using Distress markers and a waterbrush to soften and blend the colouring. I used Peeled Paint for the leaves and the stem and a combination of Barn Door and Worn Lipstick to colour the rose itself. Thanks for visiting my project today! After much negotiation with My Mind's Eye, Frantic Stamper has secured an exclusive re-run of the much sought after Stella & Rose Gertie Clear Stamps. 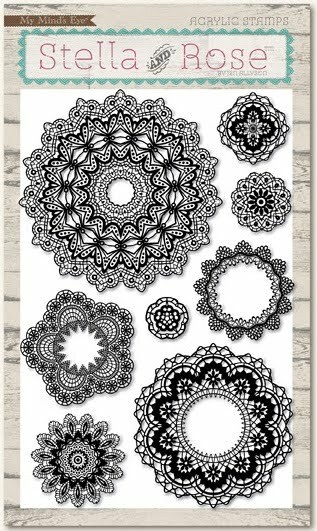 Featuring 8 beautiful doily stamps, this set has been featured in many stamping magazines. Unfortunately, My Mind's Eye sold out over a year ago with no plans to manufacture them again. GOOD NEWS! We talked them into producing 1 more run, and we bought them all! We have just received 600 of this gorgeous stamp set. We anticipate these to sell out quickly! Place your order now!